Fear is a real thing, whether it is rational or not. I remember when my thyroid disease and Hashimoto’s was at its worst… the night terrors that stole my joy and my sleep and the fear of even taking the trash out in the dark for fear something was lurking. I would chant, “if the Lord is for me, who can come against me”, over and over until I got back inside or fell back to sleep! We all have big fears, small fears, irrational fears, and fears we don’t speak of. Fear is crippling. Fear can make you physically ill. Fear can cause you to miss out on blessings, friendships, opportunities, and the purpose God has ordained for you. Fear is NOT from God. But today, you can turn that fear over to God and move forward. Today, you can let go of the anxiety and open your hands for the peace that God has for you. 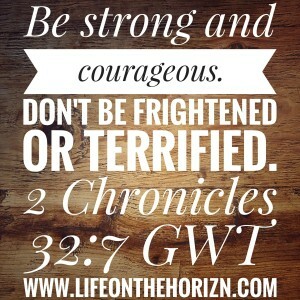 Today, you can turn to God and ask him to show you ways to overcome your fear. And until you’re ready to let go of those fears, do not worry. Even in our darkest, most fearful, anxious moments, he is there to guide and protect us. He will never leave our side. However, today is the day to rise up and be strong and courageous!